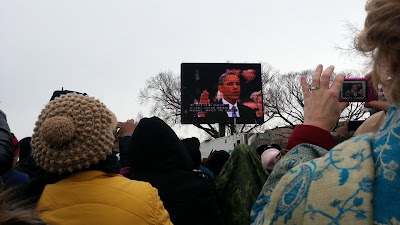 Four years ago I stood, toes frozen to the ground, fingers numb, listening to the last phrase of President Obama’s first inaugural address as it rang through the crowd. It had already been a long day—waking at 4 am and walking from National’s ballpark to a spot right opposite the Smithsonian Castle—but I could feel the excitement, the pulse of the crowd, the mood of the masses. After all, most, if not all, had come to witness, to be a part of a moment in time when our county crossed a barrier that we weren’t sure we would ever cross. 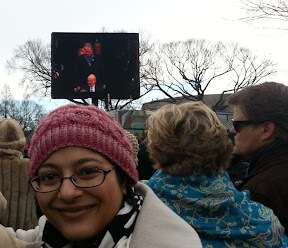 This year I got up a little later, with better shoes, and once again made my way down to the National Mall. Once again I found myself next to the Smithsonian Castle. Once again we took pictures, waved flags, and listened as the words boomed through the hundreds of thousands of people who had come to once again bear witness…. …And as we walked home I thought about the moment. I thought about my conscious decision to come down to the National Mall to be a part of this event. And I had to ask myself—what type of historical memory was I making? If Jason had interviewed me on the mall that morning I am a hundred percent sure I would have used the exact words, made that exact same assertion. I wanted to be present at a time and place where something historical was going down. I wanted to be a witness, to see something first hand rather than reading about it in a newspaper, or in a book, or seeing it from a far with the barriers of electronics and wiring and tubing. I wanted to be amidst the crowd, feeling wind on my cheeks, and the vibrations from the loudspeakers down to my very toes. But if he asked me that night? I would probably have had a different answer. 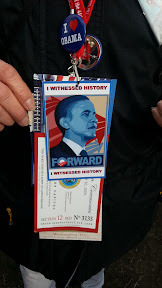 After walking back to Foggy Bottom, I hustled over to volunteer for one of the Inaugural Balls selling official merchandise. 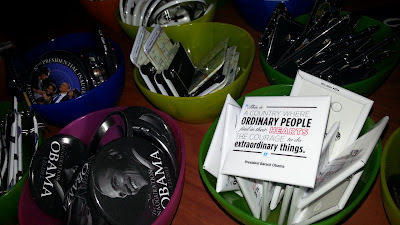 While there I worked with a few individuals who had spent the last few months working on the ground to rally support for the Obama campaign, some who had graduated from college and immediately begun gathering support. As I listened to them talk, I realized that this moment was much more than a moment, it was the culmination of years of hard work—of dedication and long hours for something that they believed in. So when I finally exited the convention center, long after the party goers, I realized the day had been transformed. Yes, I had started out wanting to be a part of something bigger than myself, a part of history, but it became a practical lesson about being a historian. Our memories are all constructed by our experiences and our choices. They are linked to our yen for inspiration, our eagerness to be a part of a hope of greatness, to live in a time of meaning. This is a feeling that exists in every generation, every class, every community—no matter our politics or faith. As a historian it is my job to strive to understand those moments, those motivations, and to understand why people just like me, in years gone by, made the choice to stand, to gather, to live. As a witness to one aspect of that day I am now more self aware, and sure in my responsibility to see—and to document—so that others can understand. We must act. We must act knowing that our work will be imperfect. We must act knowing that today’s victories will be only partial, and that it will be up to those who stand here in four years and 40 years and 400 years hence to advance the timeless spirit once conferred to us in a spare Philadelphia hall.